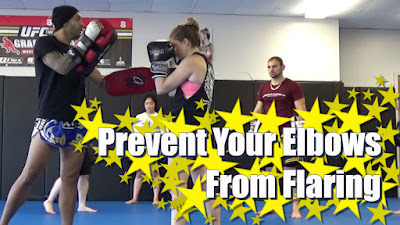 Acumen Athletics: How to Prevent Your Elbows From Flaring When Punching. How to Prevent Your Elbows From Flaring When Punching. Here's a drill that'll make your punches quicker and harder for your sparring partner to see. Have your partner hold the opposite pad a few inches away from your elbow. Don't get to close that your punches will get smothered. When you punch don't let your elbow hit the pad. Hope you find this drill useful and don't forget to hit the like button, share with your teammates and leave a comment with any of your Muay Thai training concerns.